Preheat the oven to 350 degrees . In a large mixing bowl, combine peaches, honey, 1 teaspoon flour and cinnamon. In a medium mixing bowl, whisk together oats, remaining flour, brown sugar, pistachios, ginger, cardamom and salt. Using a wooden spoon, mix in yogurt, then butter; stir until oat mixture is moistened. 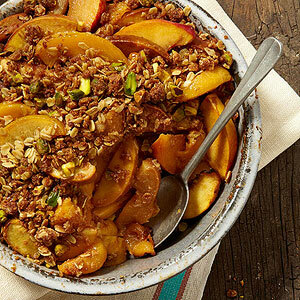 Pour peach filling into a 1-quart baking dish and top with oat mixture. Bake for 35 minutes or until filling bubbles around edges and a knife inserted in the center meets no resistance. Let rest 10 minutes before serving.